Kohinoor Leather Company and its associate popularly known as “KLC” has centuries old back ground of leather business with a vision to move into overseas market. 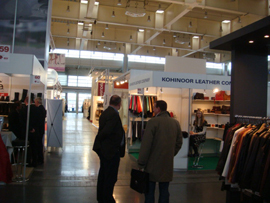 Our main function to export finished leather and later as expanded to finished goods and shoe upper. KLC Company is a recognized name in exports around the globe. “KLC” centuries old back ground in leather business, makes it self sufficient comfortable in sourcing of raw material and having its our own production unit start from raw skin to wet blue & wet blue to finish with this technical equipment supplemented by dedicated professional and technician caters the need of top shoe brand fulfilling their stringest quality standard, quantity & on time delivery. The establishment of our wet blue tannery in Kolkatta helps us to convert the raw leather to wet blue in minimum possible time as Kolkata is the hub of raw leathers. The establishment of our finish tannery in Ranipet Chennai gives us the added advantage of taking maximum benefit of its weather and climate which is most suitable for leathers as some of the finish leather can only be made in Ranipet and its peculiar water. “KLC” has its our own raw material sourcing and having raw to wet blue tannery in Kolkatta and wet blue to finished tannery in Chennai bring down the cost of our product and also help us on time delivery. By continuously upgrading our manufacturing technique and embracing the latest technology and innovation keeps us abreast with the modern demand as well as our quality standard. Karai danga (Bantalla), West Bengal.